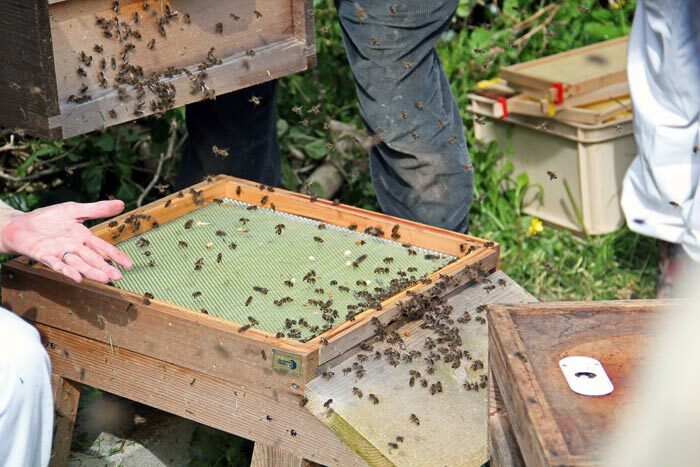 Shown here are a few photographs taken during Roger Patterson's visit entitled 'let's Keep Beekeeping Simple also incorporating 'Bee Improvement'. A small talk and meal took place on Friday 31st January 2014 - 37 people attended - a very good turnout. On the following day (Saturday 1st February 2014), the main talk was at The community Room at St Sampson High School- this was also very well attended and very informative with 42 people taking part. Roger Patterson started beekeeping in 1963 at the tender age of 15 and at one time he managed 130 colonies. He lectures widely and is a BBKA trustee. In 2011 Roger took over Dave Cushman's website which is a very comprehensive and authoritative - A link to this site is in the links section of this website.